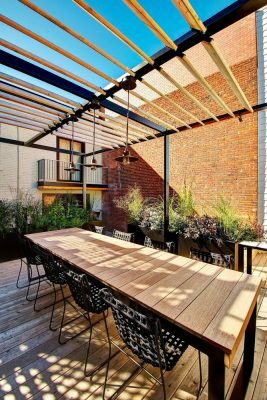 Interior designer Martine Brisson has designed a spacious, versatile back deck for an 1887 heritage home in Montreal’s Plateau district, now occupied by a single family. 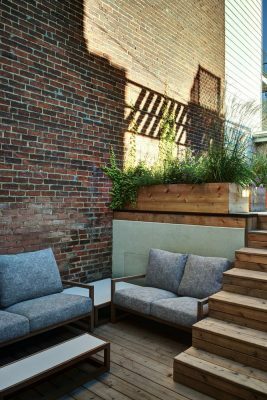 Built in a consortium with landscape architect Roxanne Miller, the project won an award for best residential patio and landscape design for a private residence at Quebec’s 2017 Grands Prix du Design awards. 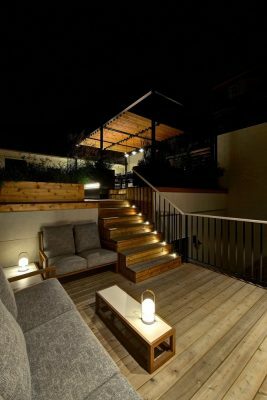 The challenge was to create an inviting setting with ease of movement between the house and garage, which do not have connecting entrances and are not on the same level. The garage is a modern, detached structure added about a decade ago. It covers a large portion of the lot. The goal was therefore to use the roofs of the two garages, which have different heights, and build a new level at the door to the house. 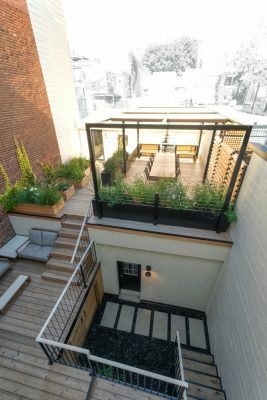 The net result: the house would be connected to both the new deck and the garage. 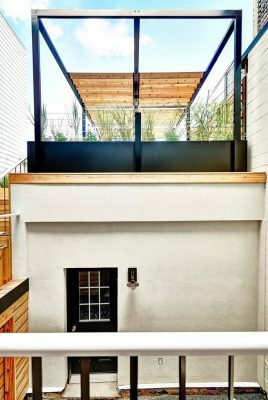 To achieve these goals, the space was planned on four levels: the garage entrance, the living room/lounge corner (on the same level as the house), the garden/traffic area, and the cooking/dining area (on the garage roof). 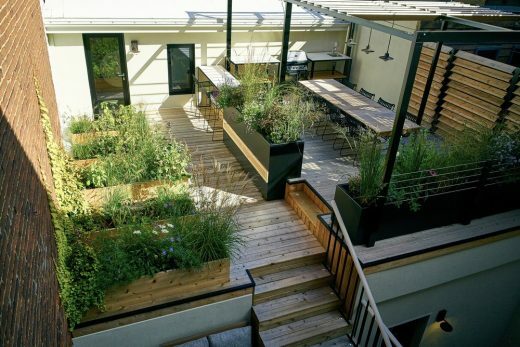 The different zones enable the separation of functions and make the outdoor living space particularly dynamic. 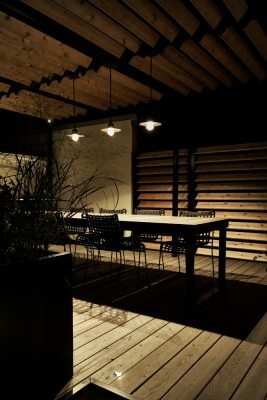 The most dynamic zone is the dining corner, located at the highest point, while the lounge area, on a lower level, is a private and cozy cocoon-like space. Privacy was a high priority for the owners, given the property’s location on a street of attached houses. They also wanted to have as much vegetation as possible. 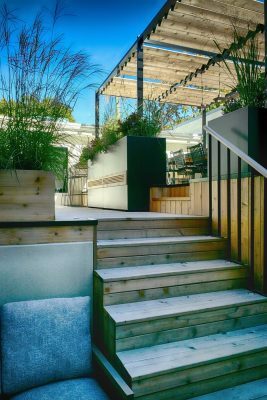 After working together on the Terrasse Coloniale project, Martine Brisson once again called upon landscape architect Roxanne Miller and her team at Verdigo. 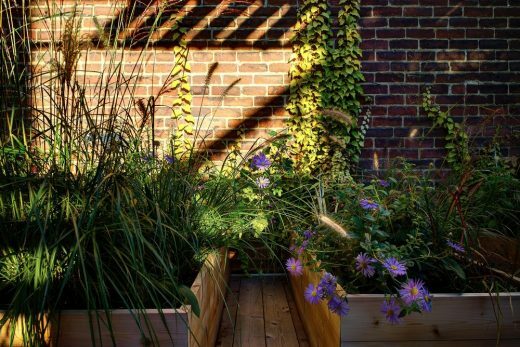 The horticulturist opted for low-maintenance flowering plants with a high tolerance for direct sunlight. The plants give a luxurious, whimsical touch to the sleek, contemporary design. 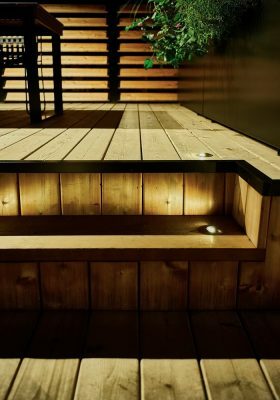 The extensive use of cedar, punctuated with black metal elements, ensures a consistent look for the different spaces while giving them a contrasting natural and urban ambiance. 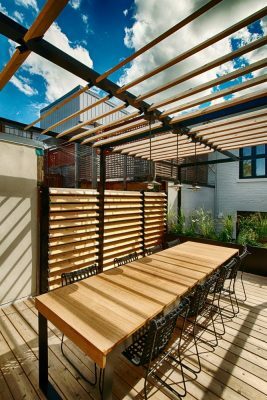 Cedar planks cover the floors, walls, planters, blinds and pergola. 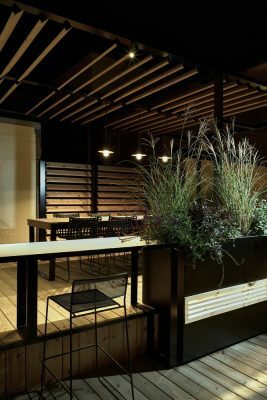 Black steel boxes with integrated lighting hold plants and separate the traffic area from the cooking space, helping give it a more intimate character. The slight change in level provided by a stair riser also highlights the distinction between the two spaces. 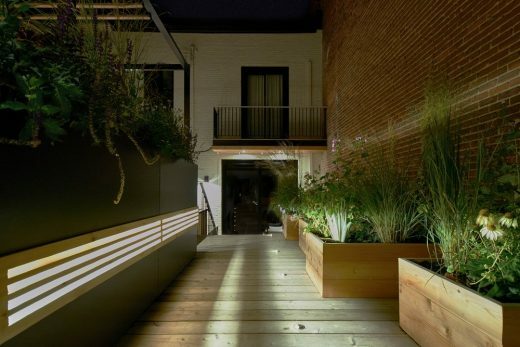 Martine Brisson is a designer whose unique career path has led her to approach space in ways that sometimes resemble architecture more than interior design. Before thinking about a space’s contents, she focuses on the envelope that defines it. Before studying to become an interior designer, Ms. Brisson was a fashion designer, operatic soprano and multidisciplinary artist. 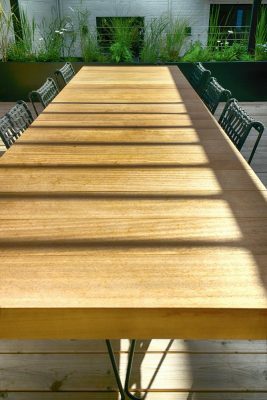 During her international tours she cultivated her talent for design and her love for architecture and spaces.